Papertrading is completely free to use, and allows you to trade using real life exchange data using fabricated crypto. This way you can experience the platform for free, without risk. 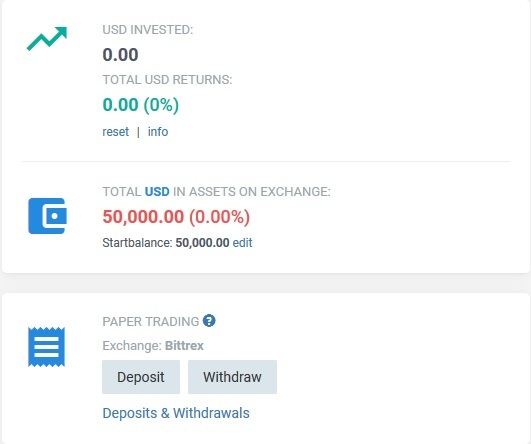 If you’re just starting with Cryptohopper and do not yet have an exchange account, papertrading allows you to experience the platform without needing to register for one. Papertrading is also useful for those of you who do have an exchange account, but would rather see how Cryptohopper works before linking yours. Just hit the papertrading switch at the top to get started. If you’re already on Cryptohopper, but want to try papertrading, Just head over to Config → Baseconfig → Exchange and select It there. When papertrading, you’ll see a sudden tab under your invested tab on the dashboard: Paper Trading. if you click “Deposit” You’ll be able to select how much play crypto you want to trade with. You can select any currency you want and see how your hopper would interact with it. Remember, papertrading is just like regular trading. That means, to start trading you need to make sure that everything else is set up. Set your own strategy or try a template. Use papertading as a testing lab for all your cryptohopper strategies. Keep in mind that you can only have 1 papertrading-hopper per exchange.